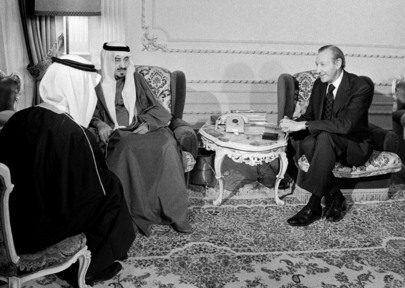 Secretary-General Kurt Waldheim (right) meeting with King Khaled Ben Abdel Aziz Al Saud in Riyadh. At left is an interpreter. During the meeting, Mr. Waldheim presented King Khaled with the United Nations Golden Peace Medal tor his significant contribution to international peace.